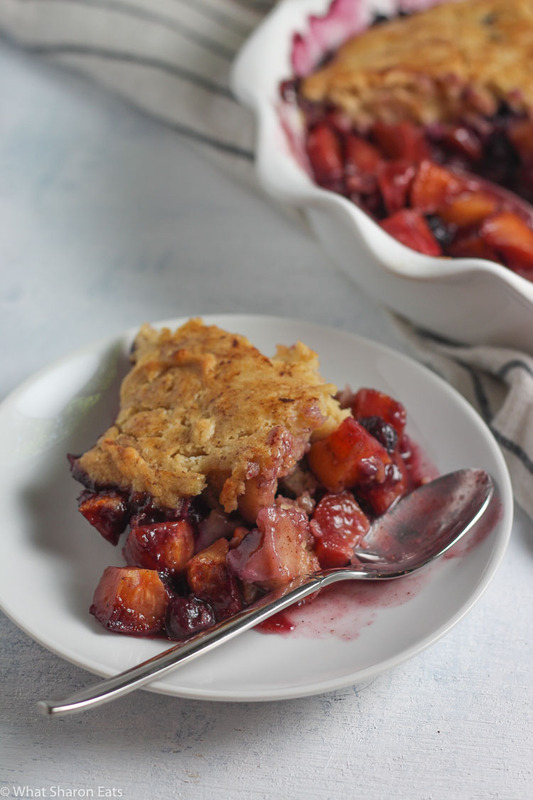 Nothing screams summer quite like this berry peach cobbler. 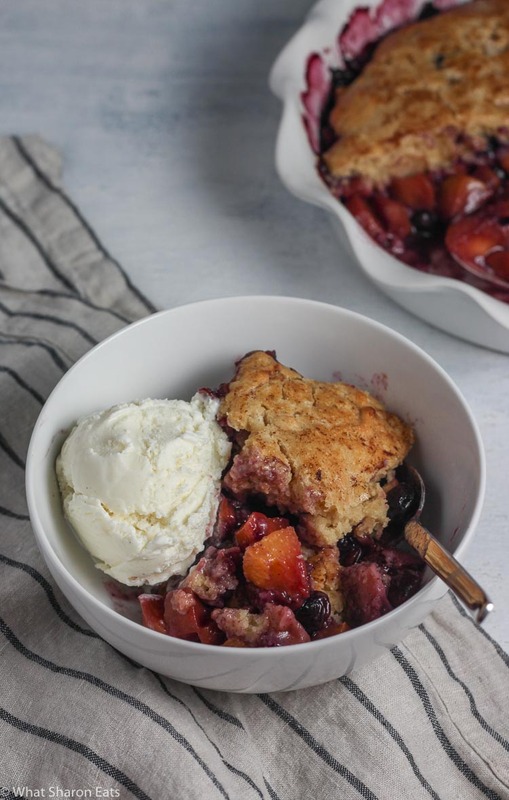 Fresh blueberries and peaches combined with a crisp, buttery layer and a giant scoop of ice cream make it the perfect indulgent summer treat. 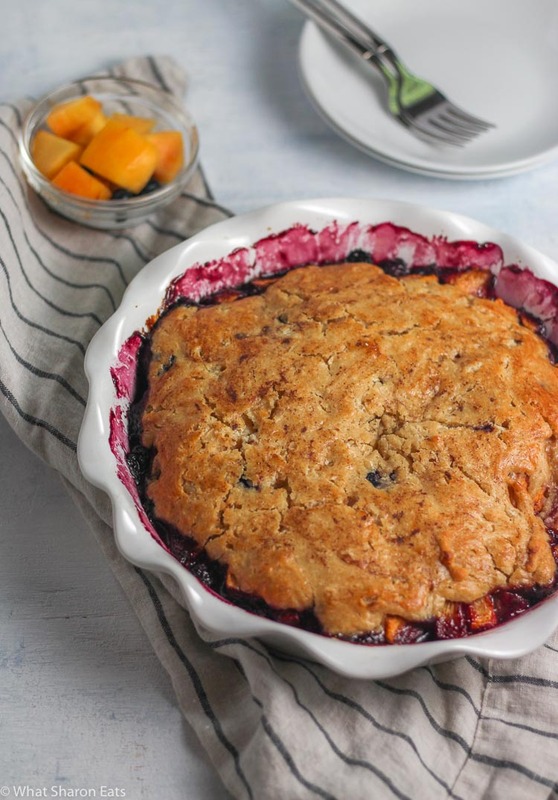 And it is a very appropriate way to use up all those fresh blueberries from your local orchard. Unfortunately, it’s been raining every weekend here, and I haven’t got the willpower to go out and pick blueberries in the rain. So, sheepishly, I confess that mine were store-bought, and with the “Buy One, Get One Free” sale at the store, I ended up with more blueberries than I knew what to do with. 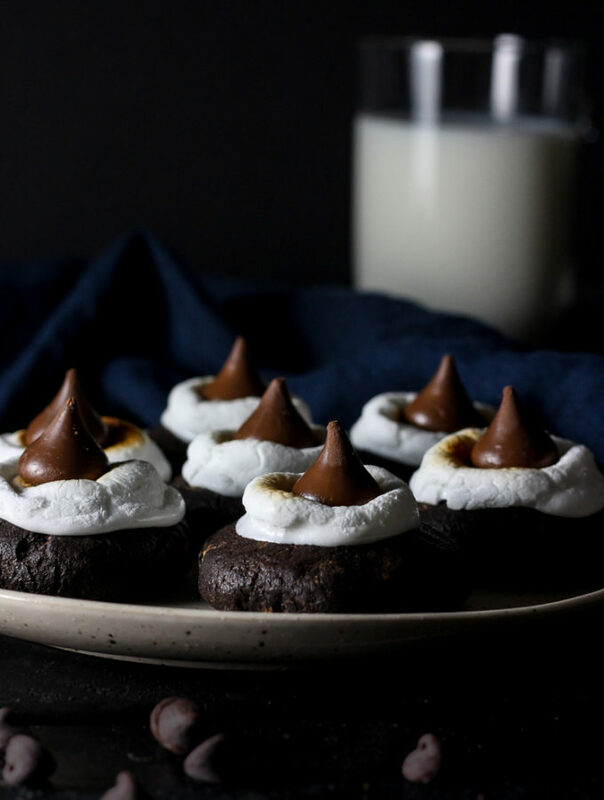 Perfect excuse to make something sweet, right? 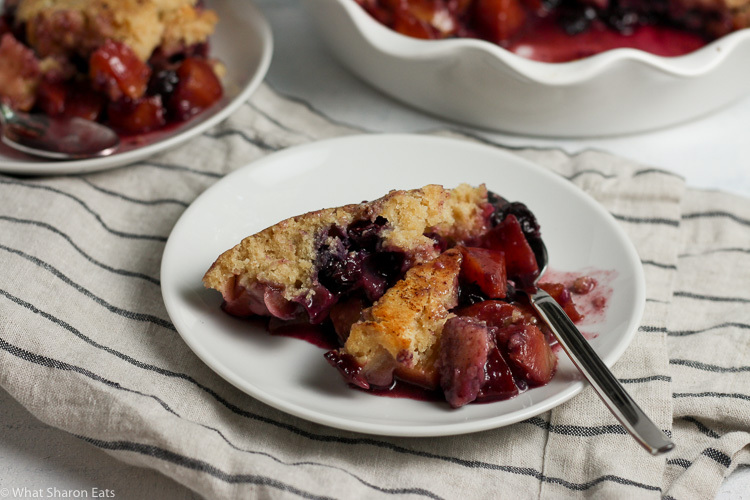 Anyway, last year, I made this dish with just peaches, and the filling was out of this world. When baked, they just leaked juice in the pan that was then, of course, soaked up by the biscuit topping. I love how versatile this dish is. You can build it with a mix of all kinds of fresh summer berries, and it would be just as amazing. 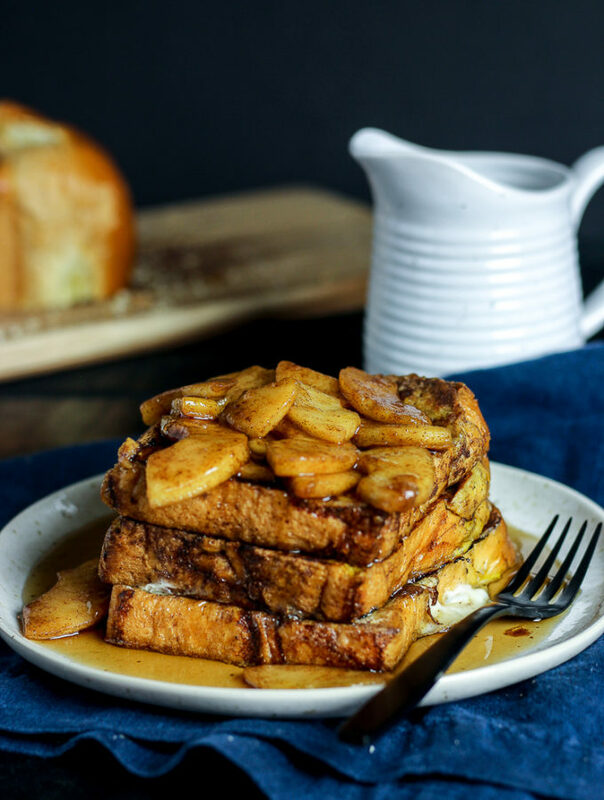 The egg white wash makes the top particularly browned and crisp. Sprinkle some course sugar over the top, and it will impress even the pickiest eater. 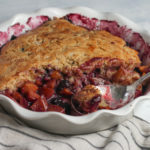 My cobbler was completely done 30 minutes out of the oven, but I was using a ceramic pan and my oven tends to heat up a bit faster, so watch your dish starting at the 25 minute mark. Sadly, we left the rest with my parents. We regret that decision very much. Preheat oven to 400 degrees Fahrenheit. 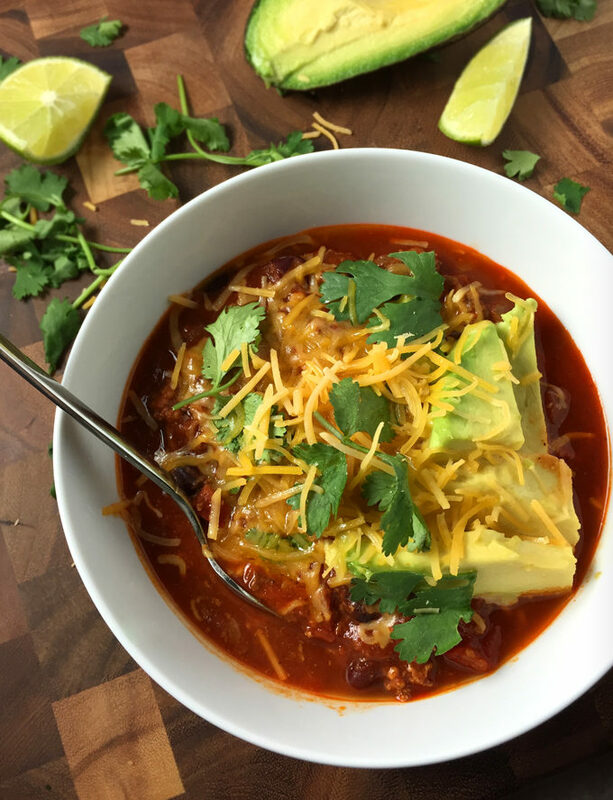 In a large bowl, mix all the filling ingredients together. 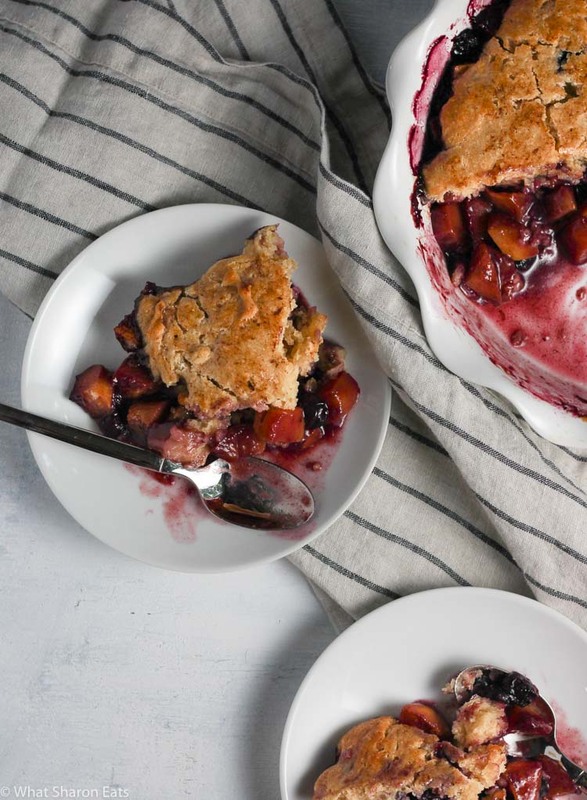 Pour filling into a 9-inch pie pan or cast iron skillet. Bake on a middle rack for 10 minutes. In another large bowl, mix together the flour, brown sugar, baking powder and salt. Using a pastry blender or a large fork, incorporate the butter into the flour mixture. Stir in the buttermilk. 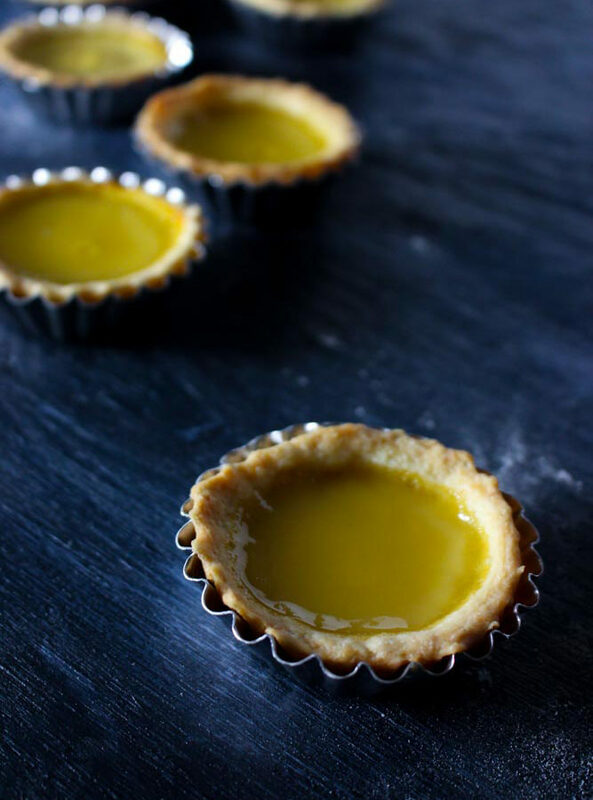 As an alternate to buttermilk, you can mix milk with a tablespoon of lemon juice. Let it sit for a minute and then incorporate it into the batter. 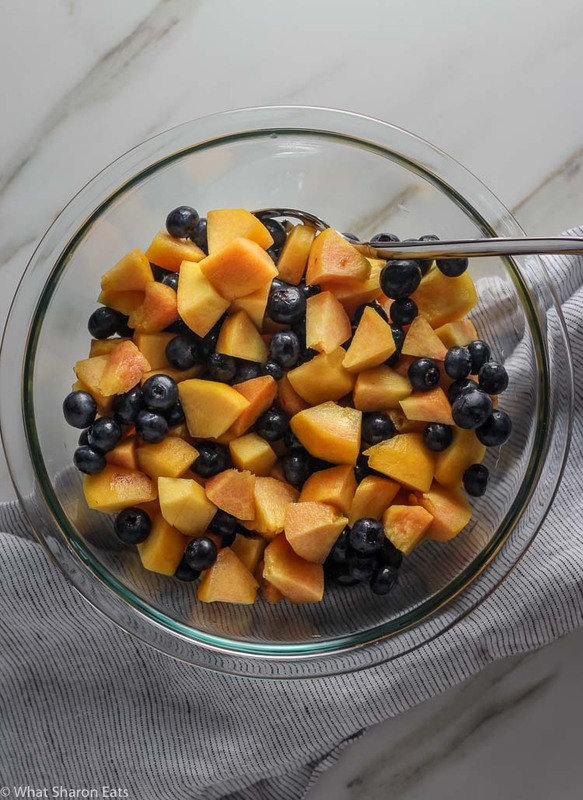 Pour the batter over the peaches and blueberries. Spread out the batter as evenly as you can. Alternately, you can drop spoonfuls of the batter over the fruit to make 5-6 separate biscuits. In a small bowl, mix together the sugar, cinnamon and egg white to make the egg wash. Using a pastry brush, brush the egg wash over the biscuit batter. This will create a nice crisp and browned top. 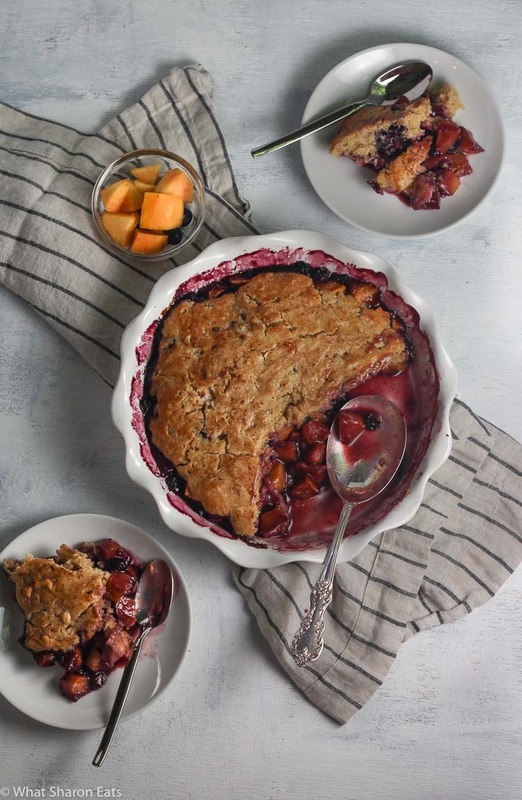 Return pie pan or skillet to the oven and bake for an additional 30-35 minutes or until the biscuit topping is lightly browned. Let cool for 10 minutes. Serve with ice cream.